If you are a student, faculty, or staff member, and the RBC Library does not have a copy of the book or article you need, we can request it through Interlibrary Loan. We request items from colleges and universities all over the state of Virginia! If you wish to place a request, first check the catalog to make sure we don’t have a copy. You can use WorldCat to see what’s available or fill out the form below. Students may request only five books at one time. If late returning ILLs, students will be charged $1.00 per day per late item. Feel free to email library@rbc.edu with questions regarding ILL! 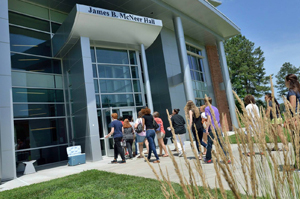 In addition, Richard Bland College students and faculty are allowed to checkout materials in-person from any college or university library in the Richmond area. You must pick up a Richmond Academic Library Consortium (RALC) pass from the RBC library and show your RBC ID at the participating institution.